Warning! Warning! 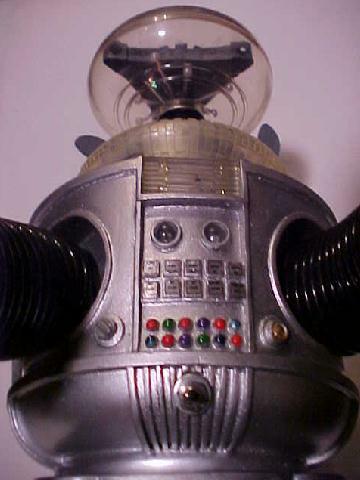 B-9 Robot Coming thur from televison history Classic 60's series Lost in Space. Newly just built from the Masudaya YM-3's 80's issue model kit made in Japan. 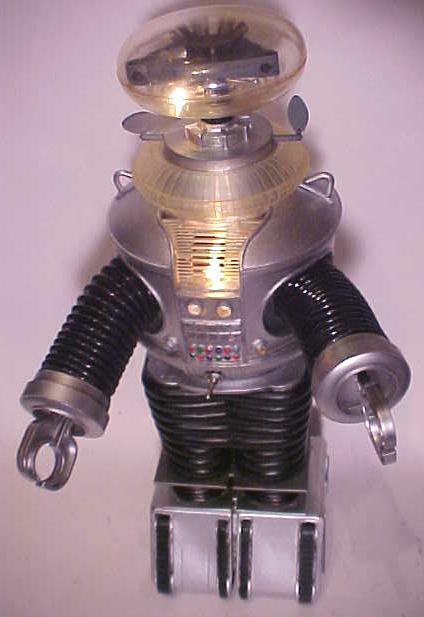 This hero B-9 Robot painted color-scheme after first season black & white television. 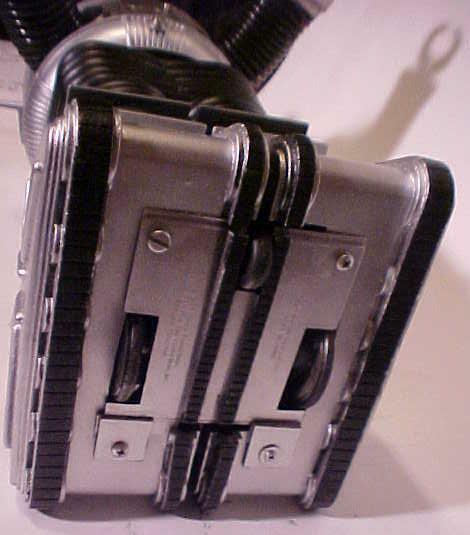 Bottom-Platform Added Rolling Wheel-Action Switch Between Lower Back Legs. 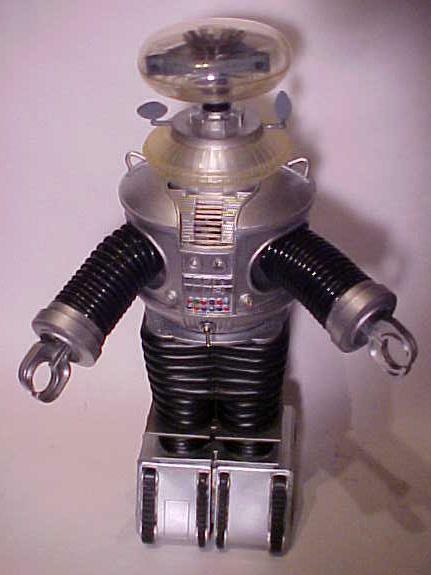 Works Great: Powered By Three AAA-Batteries Sits In Bottom Of Legs. 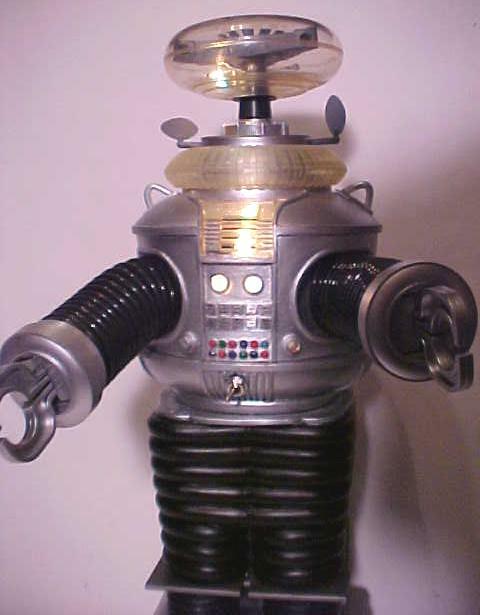 * IMPORTANT Custom-Feature: First Season B-9 Made Squatty-Look By Removing One Leg Ring. Was Accomplished Very Smart Way As You See From Photos It is Perfect & Sturdy. 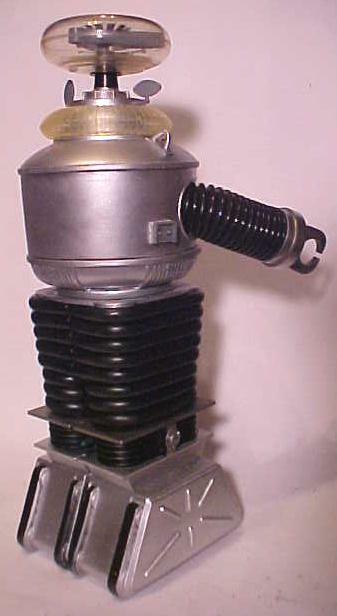 The Masadaya Robot Look Is Too Tall As It Was Based On The Stunt Robot With Fiberglass Legs. 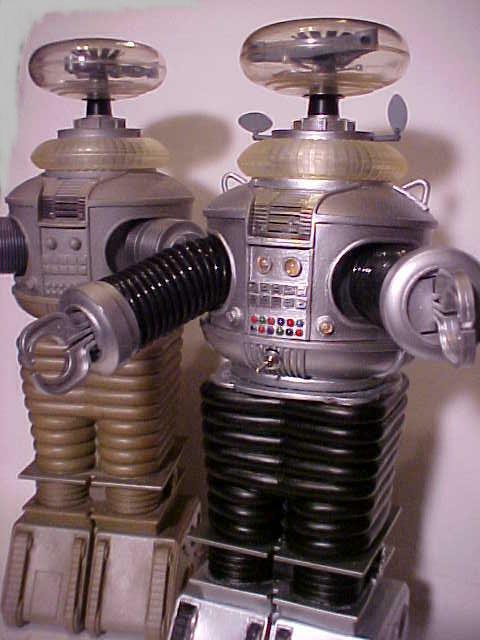 Here Robot Shown With Unfinished Masudaya Robot to Show Difference of Shorter Leg-Effect! * Robot-ARMS: Replaced With Black-Rubber Coil Flexible-Look. * Brain-Detail Highlighted With Carved Out Pattern & Star-Sensors At Neck. * Control-Plate Square-Buttons Have Decals With Printed-Word Functions. * On Control-Plate: Top TWO BIGGER BUTTONS Replaced With-Magnified Clear-Lenses. * White Blinking-Lights: Lite-UP: CHEST & BUBBLE HEAD & TWO-Custom TOP BUTTONS. * Lights-Operate: ON-Off Switch Just Under Control-Plate. 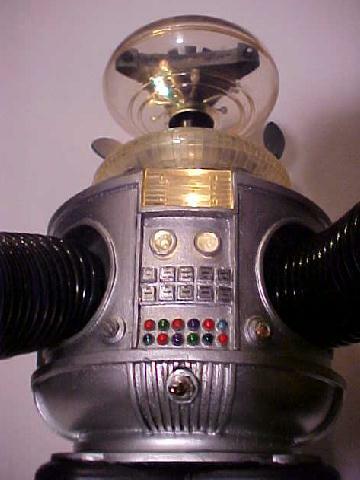 Powered From Newly Provided Eight AA-Battery-Pack Located In Robot Torso. 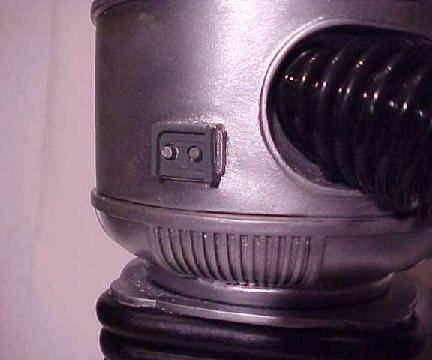 Robot Does NOT Have Voice-Box As Batteries For Lights Take Up that Space. 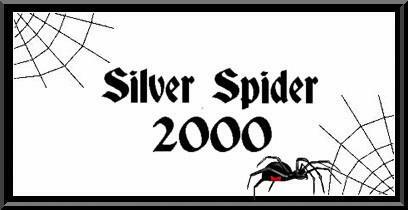 * Beautiful Paint Job Metallic-Silver Barrel & Platform / Matte-Black Legs & Treads. * LIGHTS & WHEEL-ACTION Work Independent of Each Other As Lights Can Be On Just For Display: With No-Wheel-Action / Why it has two Switches! Watch Him Blink! Watch Him Go! Sit With Him & Watch The Show! Bubble Headed-Booby! 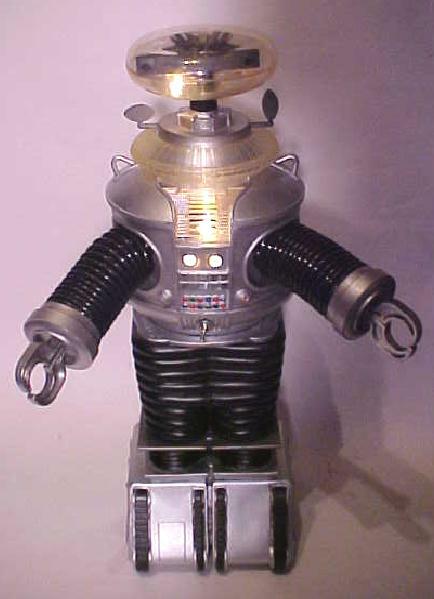 Created by, Robot Master Artist, "Jerry VonMueller".